The government has called on the mobile phone industry to do more to protect handset owners against theft. Alan Campbell, Minister for Crime Prevention, said firms "have a social and a corporate responsibility to tackle crime". Around 2% of British mobile phone users report they have suffered a theft in the last year, although for teenagers the figure is three times higher. Mr Campbell said it was also an opportunity for innovation. "First this is a great opportunity - this is new technology which can be promoted around the world," said Mr Campbell. "But also mobile phone companies have a responsibility which goes beyond the profits they can make from phones; they have a social and a corporate responsibility to tackle crime." Mr Campbell likened the problem to that of car theft. He said that following government intervention, innovations in the car industry - such as immobilisers - had helped cut theft by 60% in 10 years. Figures suggest that 228 mobile phones are reported stolen in the UK every hour. Michael O'Hara from the industry body GSMA said the mobile industry "supports and welcomes innovations that help to safeguard against mobile phone crime in any guise". He said the GSMA "leads a growing number of initiatives" aimed at tackling mobile crime including "a database of handset serial numbers" that allow a phone to be blocked when they are reported as lost or stolen. The government's call comes as the Home Office unveiled the winning designs in a crime prevention contest, aimed at making mobile phones less attractive to thieves. Designs included an alarm that sounds when a phone is too far from its owner and locks the handset. Others included a system to encrypt users data on the phone. 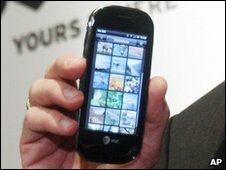 David Kester, chief executive of the Design Council said that mobile phone firms had an "amazing opportunity". "Mobile phone companies want to sell phones - we want to feel safe, to protect our money. "Just a little bit of a nudge from the government and you see innovation - there are real ideas that can make money for British industry. "Suddenly a problem that we the public all care about becomes a big opportunity." The winning designs will be shown off at the Mobile World Congress in Barcelona from the 15-18 February. Why do thieves still steal mobile phones?